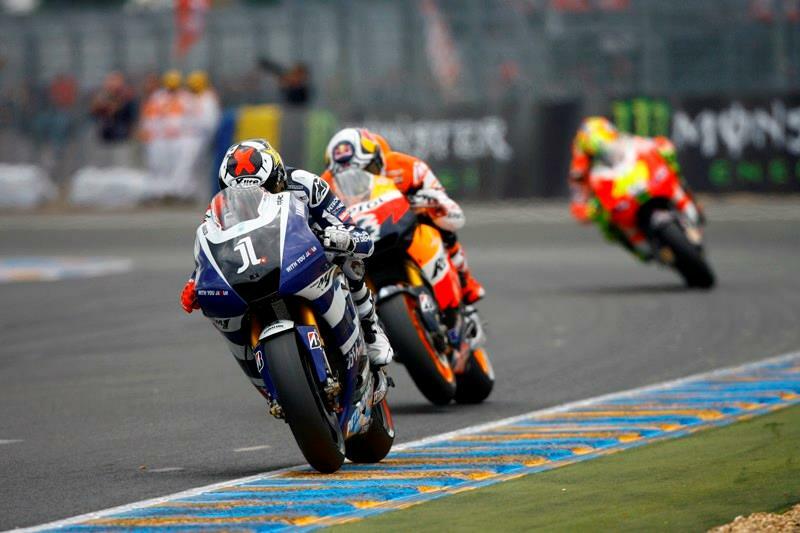 Jorge Lorenzo admitted Yamaha has work to do to bridge the gap in performance to Honda after he was comprehensively beaten in yesterday’s French Grand Prix at Le Mans. Lorenzo never looked like competing for a third straight success in France and he missed the podium for only the third time in the last 20 races after a difficult 28-lap race. He ended a massive 21-seconds behind eventual winner Casey Stoner but was also comfortably beaten by Andrea Dovizioso and former factory Yamaha team-mate Valentino Rossi, who claimed his first podium for Ducati with third. A mistake on the brakes at Turn 6 on lap 25 cost Lorenzo any hopes he had of fighting to maintain his 100 per cent podium record in 2011 and the Spaniard told MCN: "If speak about the seconds we finish behind Stoner then it is not a good race. I improved my lap times in the race compared to practice. But I was very at the limit and struggling a lot to keep this pace so at the end of the race I was tired like in Portugal. I made a mistake in one braking and when Andrea and Valentino went it was very difficult for me to fight with them again for second." Lorenzo said the YZR-M1 simply hasn’t taken the leap in performance that Honda’s factory RC212V has during the winter, with Stoner’s win the third in four races for HRC. Lorenzo, who still leads the world championship by 12-points over Aussie Stoner, said: “The problem is the bike is more or less the same as last year. This is the problem and Honda improved. We are not worse but we are not better. We are more or less the same, so we win less than last year. We had some big problems with the exit of the slow corners." "My bike always had a wheelie problem like all the Yamahas, so in the straight we lost a lot of tenths. And the bike doesn’t turn the same, so when the tyre was getting old the bike moved a lot and this also causes more wheelie. It depends on the track because in Estoril I finished five seconds in front of Stoner and now we finish 20 seconds behind him. We are not as competitive as last year and this is clear but also it depends on the track whether we can fight for the victory or whether it is impossible." Lorenzo denied his sluggish performance was the result of his confidence being dented by a heavy crash in the pre-race Warm-up session. He lost control of his YZR-M1 machine at the second chicane after pushing too hard before the right side of his Bridgestone tytre had reached working temperature. The result was spectacular fireball in the immediate aftermath but he said the spill had nothing to do with his race pace. He said: "It was my mistake completely. I exit too excited from the box to go fast from the start and my experience of the cold tyres doesn’t help me this time and I forget it. I made a mistake and I hope in the future this experience gives me more quietness for my next first laps." For full coverage of the Le Mans MotoGP race, see Wednesday’s MCN.